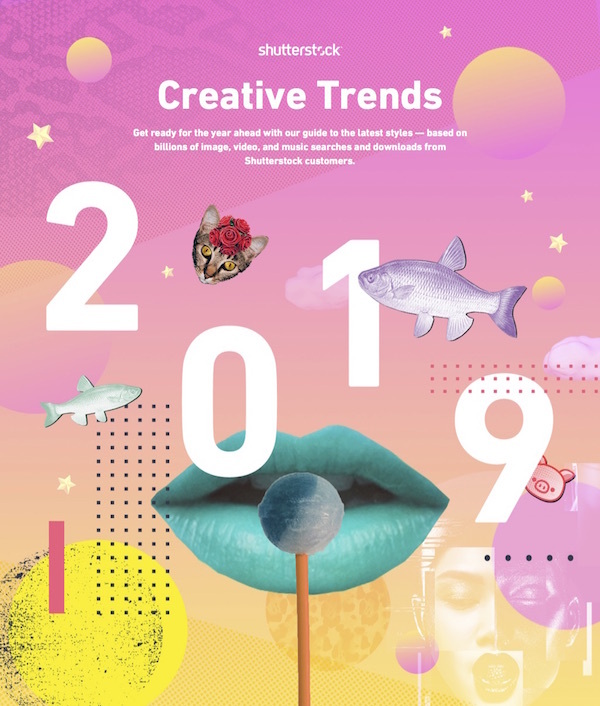 Now in its eighth year, Shutterstock’s annual Creative Trends Report is back to give you the lowdown on what’s ahead for 2019. The stock photography company has analyzed data across billions of its searches and downloads, made within Shutterstock’s 225 million-odd graphics by users worldwide, to determine trends across advertising, film, media, fashion, and more. Shutterstock’s 2019 Creative Trends Report highlights eleven design styles, many of which pay homage to the retro era, with three major trends that stand out: ‘Zine Culture’; ‘80s Opulence’; ‘Yesterday’s Tomorrow’. ‘Zine Culture’ makes headway with a significant increase in online searches for “contemporary art collage.” This style that’s based on raw, DIY aesthetic comprises collages, paper cutouts, noise, grain textures, and rough-edged layers. ‘80s Opulence’ revives the fun times of yesteryear with gold chains and animal prints. In line with many nostalgic revivals of 2018, such as the Tamagotchi x Pokémon collaboration, Puma’s restored 1986 smart shoe and retro-themed collection with Pepsi, comes ‘Yesterday’s Tomorrow’ that resurfaces old-school video games, brash neon and other vintage elements. Other creative trends include ‘Tempting Typography’, unique ‘Kawaii’ graphics, and ‘Beyond Plastic’.